So I’ve finished all my Christmas knitting… this means I get to knit things for me… no guilt… just selfish knitting! Bliss!! So as I’m aware of the selfish sweater knit a long is not starting until just after Christmas, and I’m saving the jumper I have planned until then, but I want some selfish knitting now, I figured start small. 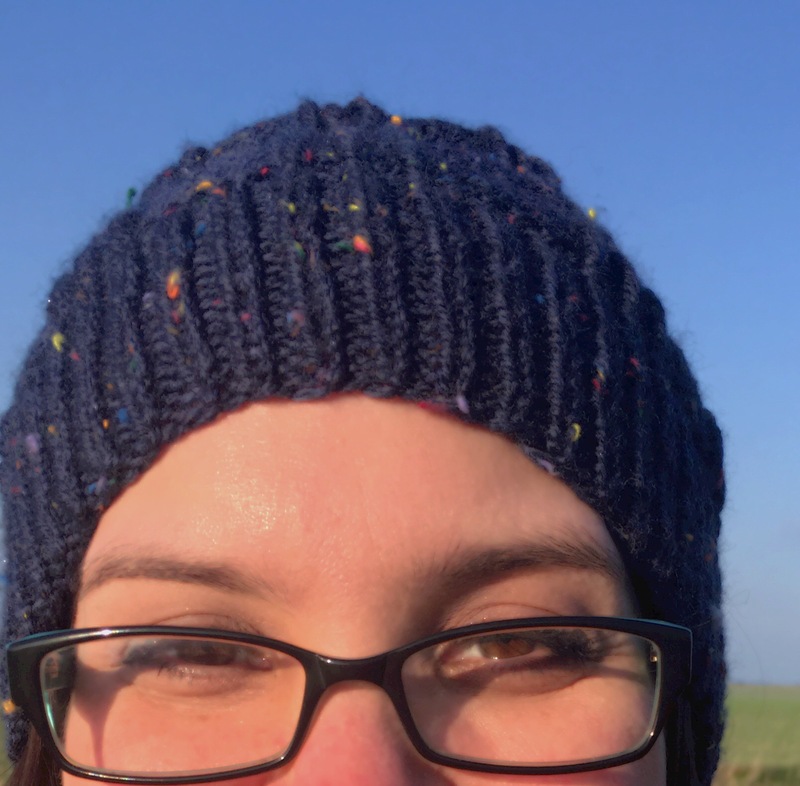 So I knit me a hat. I’ve not had a new hat in years. The last hat I owned was bought in H&M and was snitched off my head by a strong gust of wing during a storm and vanished down the street before I knew what was going on… so it’s about time I had a new hat. This cutie is called Tread by Shannon Cook… please feel free to search for it on Ravelry… it’s there, trust me. It’s an Aran wool pattern, so I used a lovely ball of King Cole Fashion Aran in the colourway Skye… those specks of colour are just too cute! 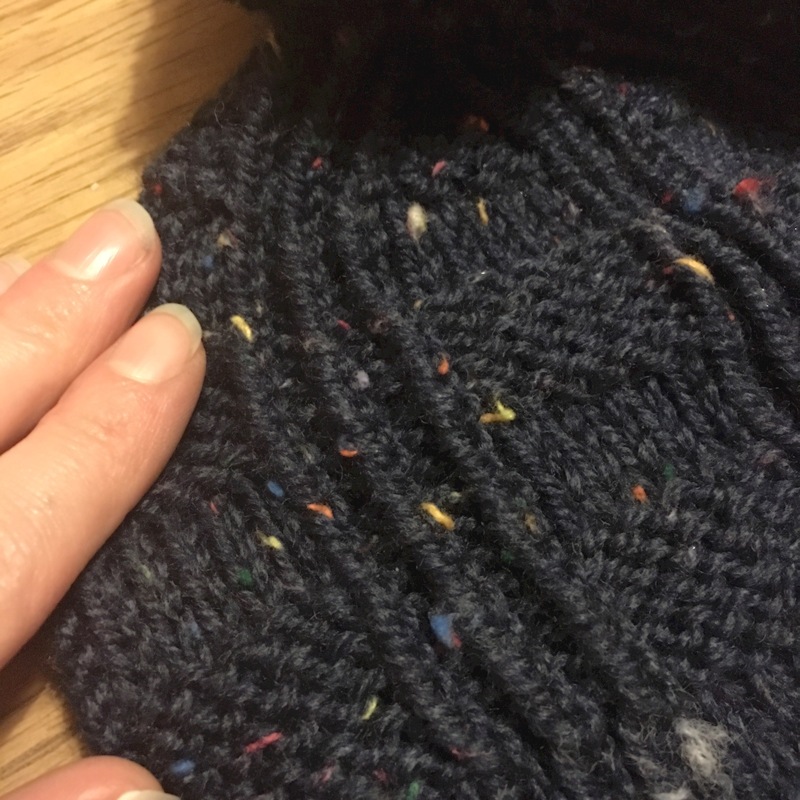 Of course I’m always off with gauge… using 5.5mm needles rather than 6mm doesn’t help! So I made up the large size in order to fit my small size head… I like a dense knit… so sue me. Let’s just ignore that red nose for a minute… there was a brisk wind… my nose doesn’t like being cold. 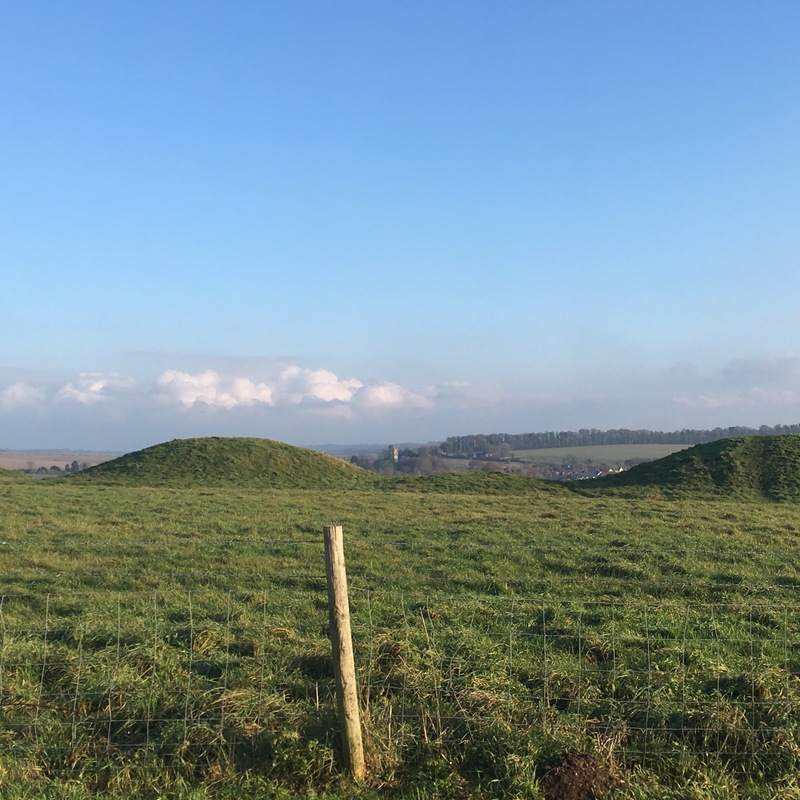 We took some photos while out and about on the Ridgeway in Berkshire this afternoon… it was sunny but brisk, as my Gran would have described this weather. Anyway, back to the hat..
I’m a little disappointed with the result. 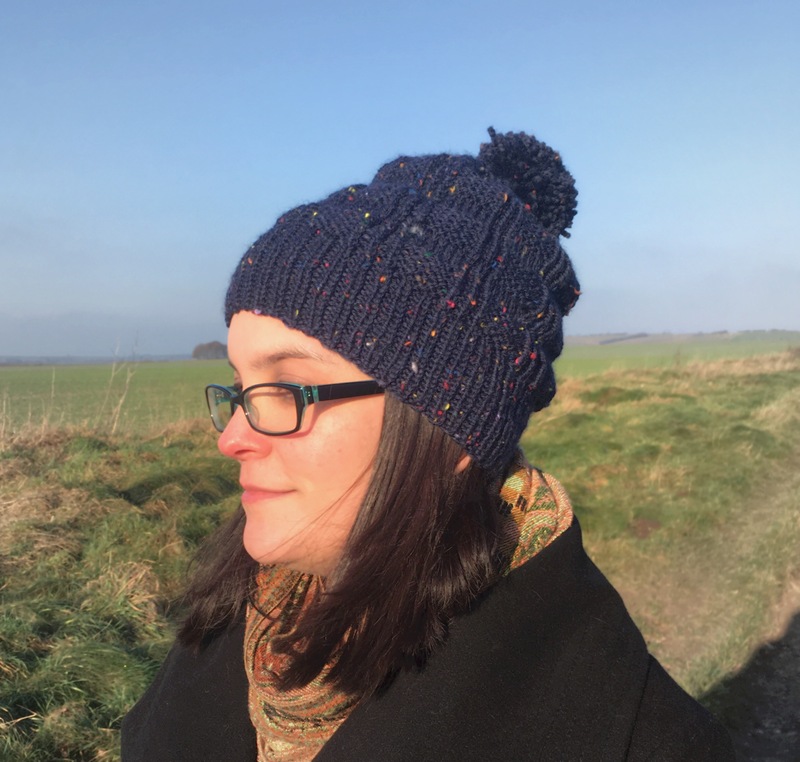 I was aiming for a non-slouchy hat with a turned up brim… but I think I’m a pattern repeat away from achieving that… so I have a slouchy fitted hat. In fact this is exactly what the pattern intended… so it’s actually pretty accurate… and I do keep kinda like the slouch. Ok ok, I like the resulting hat, even if it’s not what I aimed for! But the star of the show is the Pom Pom! This hat just needs a Pom Pom. And I made mine bigger than was really necessary…. oh yeah… that’s a good Pom Pom. I quite enjoyed the construction of this hat, it has a kind of tartan feel to it. The vertical stripes are done knitting in the back loop which makes it stand out even from the stockinette section of the pattern. I think it makes it look very smart. Are you ready for this close up? No? Tough! Ha ha. 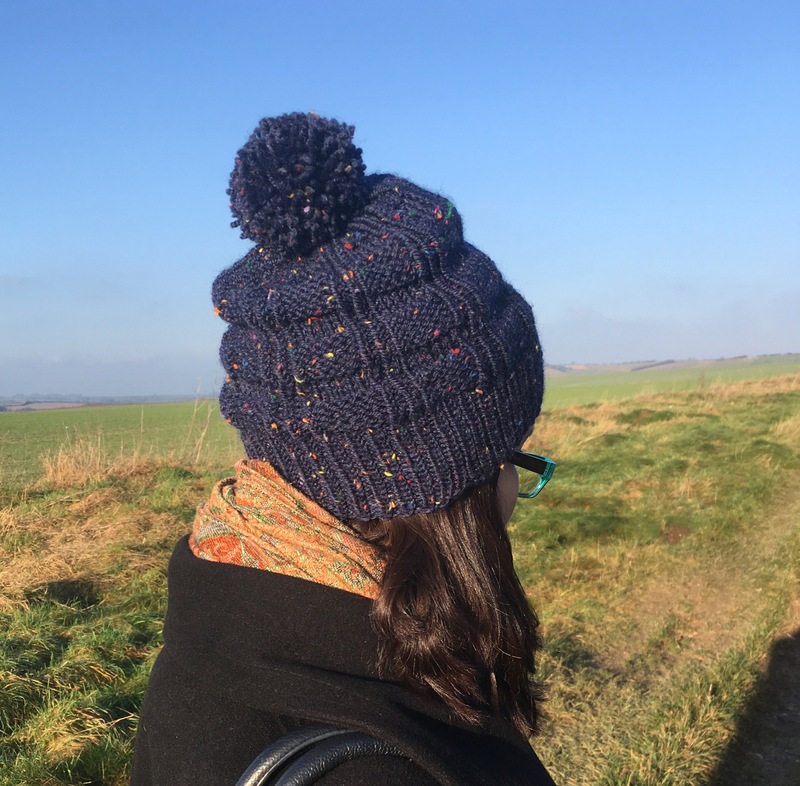 It’s a very basic pattern which I think would be absolutely fantastic for beginners… so yeah go ahead and own your own slouch Pom Pom hat… it’s awesome. See! I love a good trudge around the ancient ruins of Britain…. 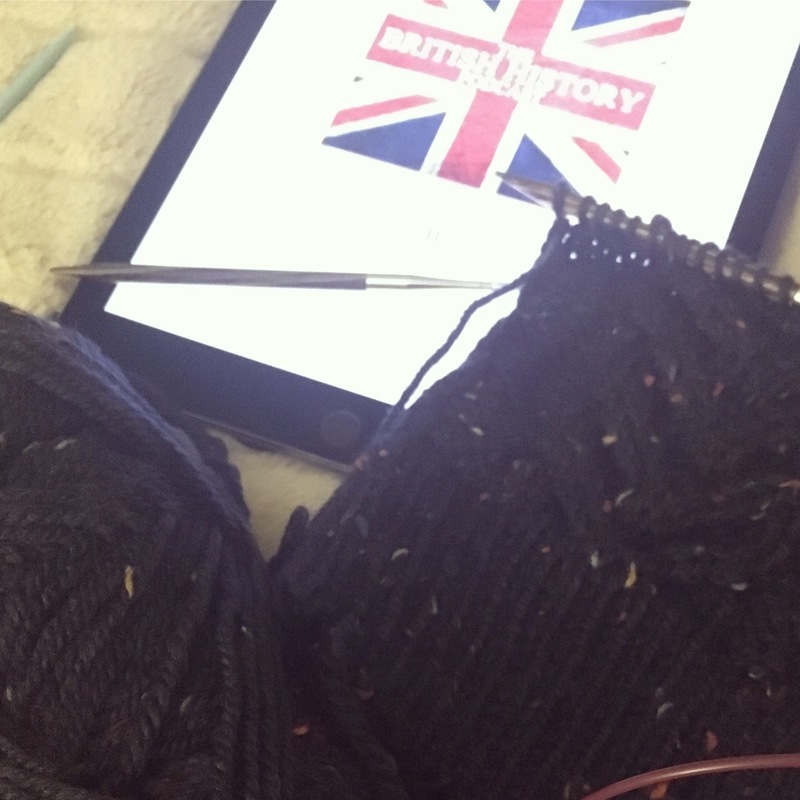 and how else could I end this day but knitting while listening to the British History Podcast, I’m learning about Theodred and his tussles with Rheged. Seriously people, this is a great podcast! I am enthused by your post and keen to knit something similar. I love the slouch. 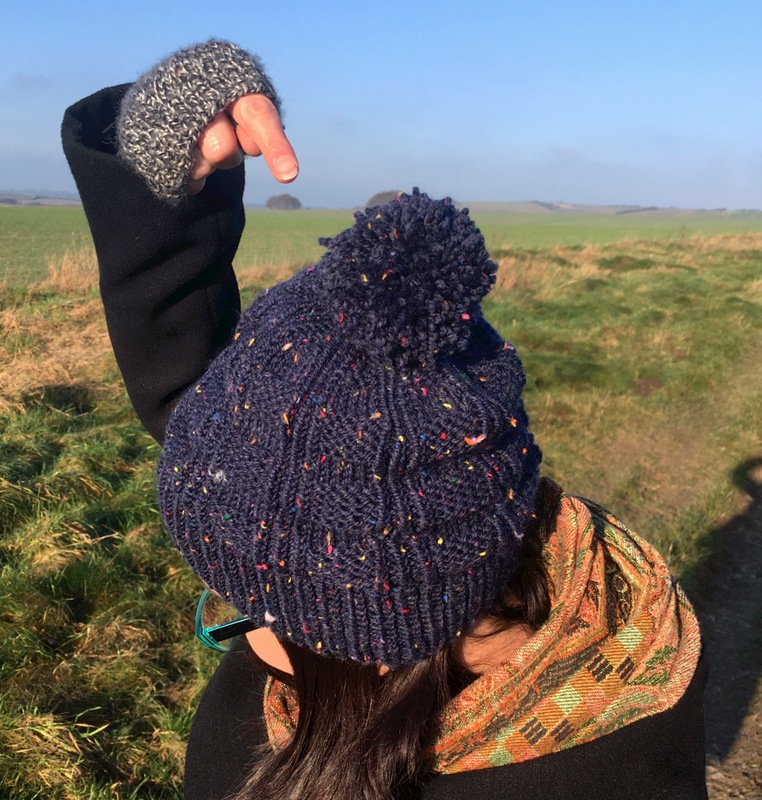 And I like your attitude to gauge – here’s wool, here are needles – why not knit? !